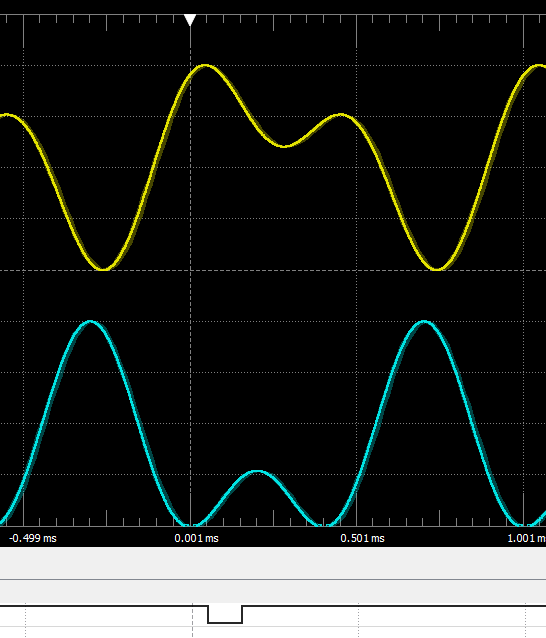 I certainly miss something, but I cannot figure out how to trigger pattern with an AWG output. According to the reference manual: Each instrument generates a trigger signal when a trigger condition is met. 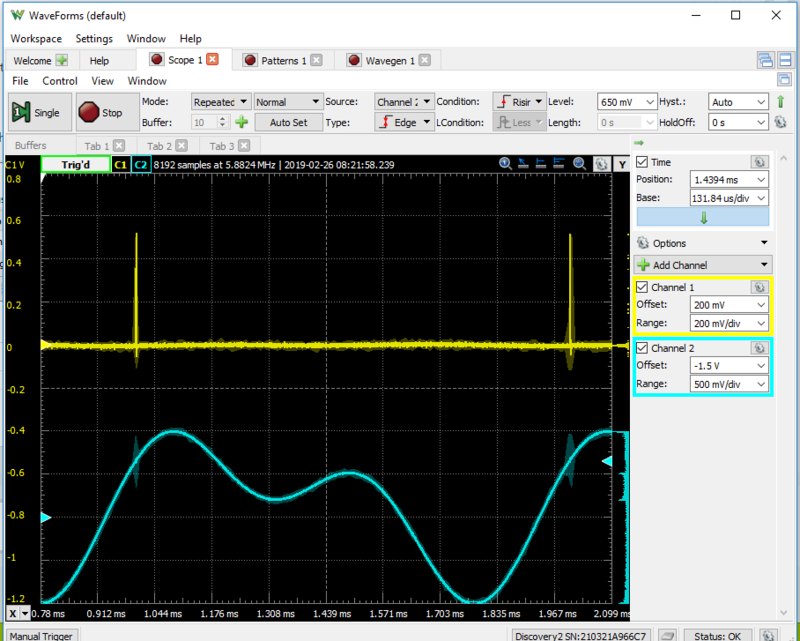 It's rather easy to trigger the AWG and the pattern output with the scope, but I didn't figure out how to trigger patterm output with AWG. I certainly didn't found what a "trigger condition" is for an AWG. What I'm trying to do is to have two AWGs synchonized and one positive pulse at phase 0. 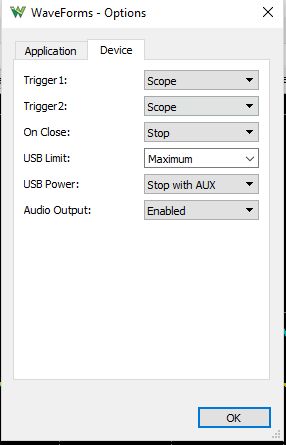 I can imagine to use Ext trigger, and to wire T1 on T2, but that doesn't seems to make sens. 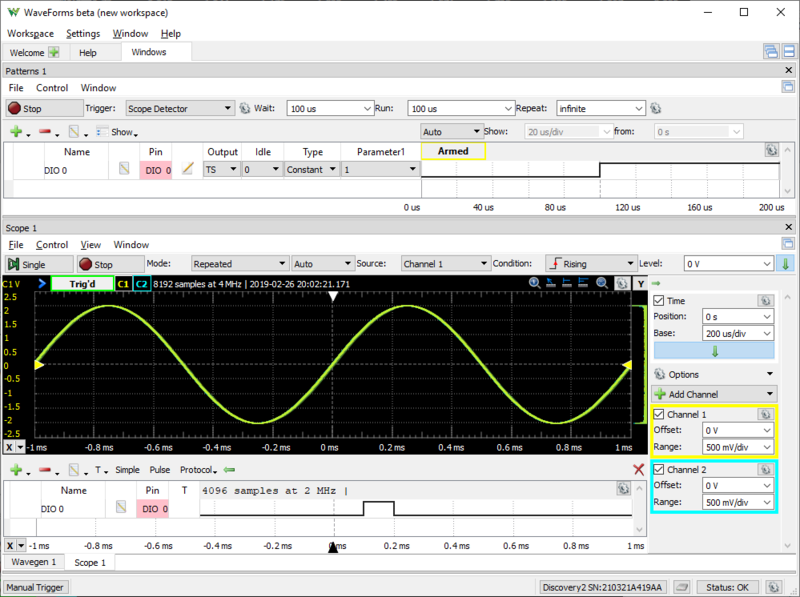 So I am properly understanding what you are wanting to do, you are wanting a way to trigger your pattern generator output (in this case a pulse) based on one of the waveform generators? 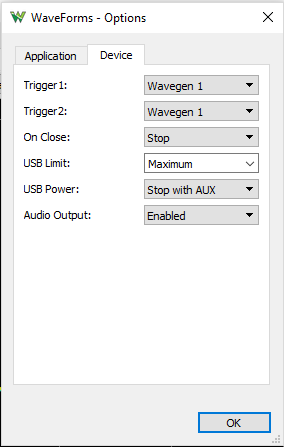 From what can see in the trigger options on the pattern generator is that you can set the trigger to be based on Wavegen 1 or 2 and with the little gear icon next to it set the trigger condition to be rising, falling, or either, but I'm suspecting this isn't quite what you are looking for. 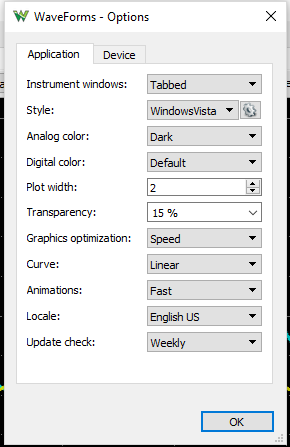 It sounds like you already have the two Waveform Generators synchronized (via the dropdown channel next to the channel enable dropdown), is this accurate? My need is really basic, I just want two signal generators synchronised one each other, and one pulse to indicate the starting of the synchronisation. 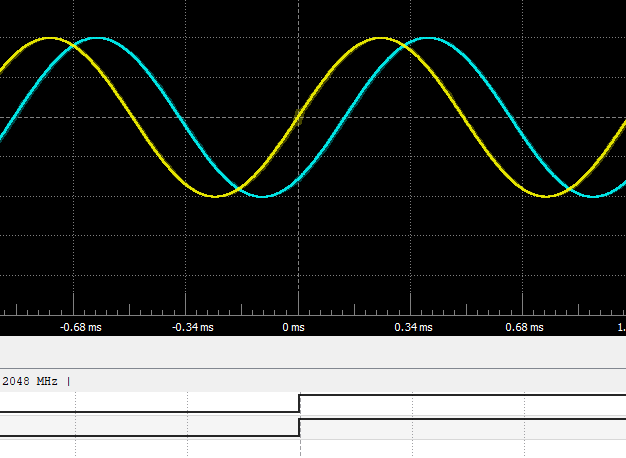 Should be that if I map Trigger 1 to Wavegen 1, it shall output a pulse on T1 pin. It does when the Trigger is mapped to scope, but not with the Wavegen. The instruments output trigger high while running. Selecting Wavegen as trigger output it will constantly output high after starter, if no trigger condition or wait time is set. Your approach with scope and patterns looks good, but in order output pulse with each trigger event select "scope detector" as trigger in patterns. In this case you don't have to have the scope running. 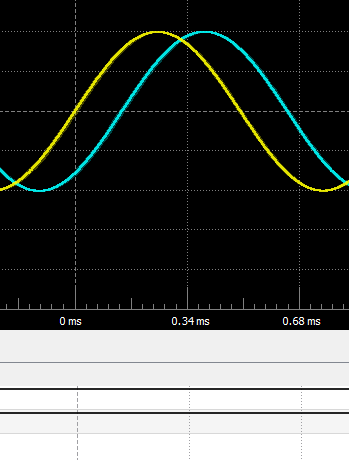 You can create signal with constant, like 0 in idle and output high, with wait and run you can adjust the timing. Thank you very much, it does exactly was I was looking for. - the first is that I doesn't understand what I'm doing. I don't know how it work. 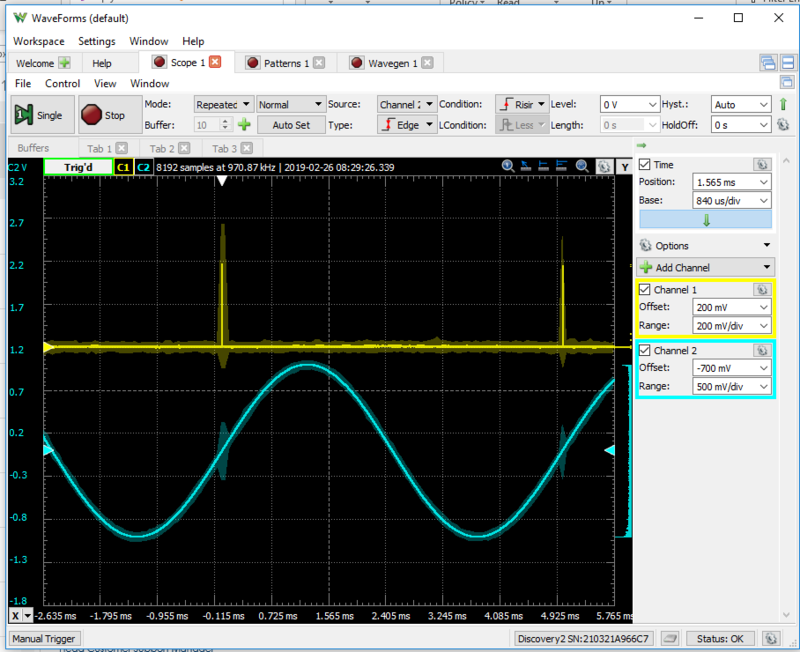 - the phase between the pulse and the AWG, depends only on the trigger level of the scope. The phase on the generator has no impact. 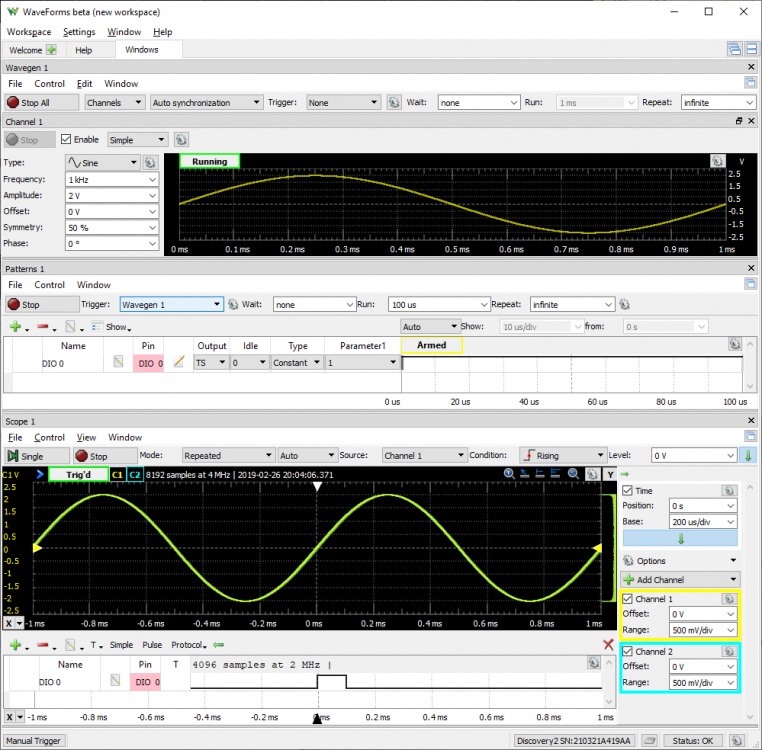 You can also select Wavegen auto synchronization to generate repeated Wavegen trigger signals, on which Patterns or other instruments can trigger.